As many banks use SMS 2FA for transfer authorization, malware authors are constantly looking for new opportunities to take over control of PC infection victims’ smartphones. We have identified a new attack scenario that involves both PC and mobile devices infection by leveraging trust people have in Google services. Recently hard working analysts from our BadCyberLab stumbled upon one of many spam runs with malware attached. 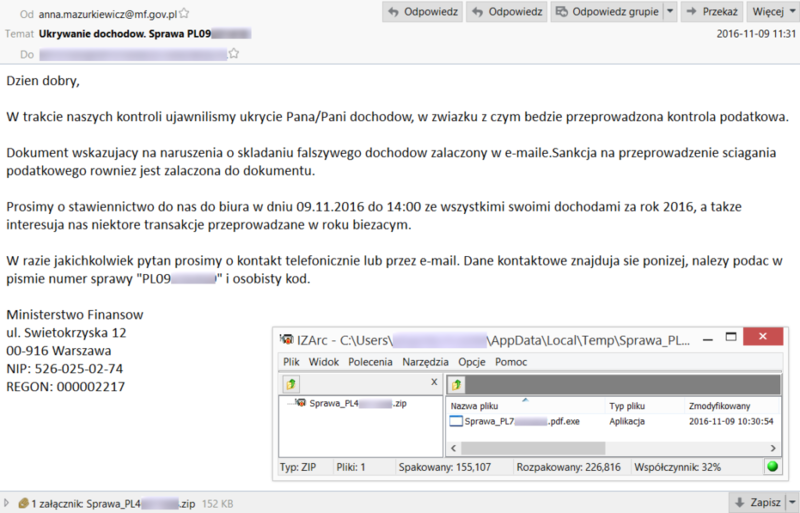 Pretending to be a message form the Polish Ministry of Finance it played on fear of tax inspection to persuade users to open an PDF.EXE attachment. The attachment turned out to be a well known ISFB banking trojan (as the naming of malware is hard with frequent code sharing and crime-as-a-service development, other names might include at least Gozi2). While such a campaign was rather dull and not worth mentioning (keylogging, password stealing etc. ), it turned out the malware has some new cards up it’s sleeve. 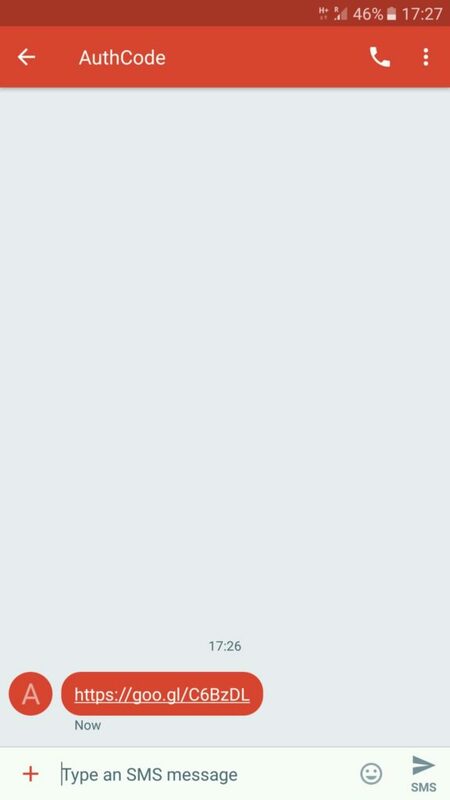 Action required: Because of suspicious activity on your account (ex. using multiple IP addresses) you are required to install our Google Authenticator Code app. We’ll send it to your phone number. This link lead to http://authcode.download (it’s off right now) where AuthenticatorCode.apk file was served, containing Marcher malware. which asks you nicely to provide a code from the app – most probably to link your infected PC to your infected mobile and to confirm successful installation of the malicious app. As the attack uses goo.gl link shortener, we can have a look at some stats. 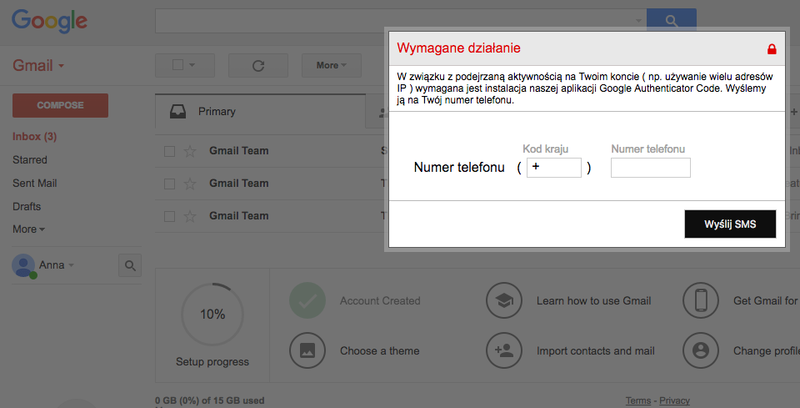 As you can see the scale is limited (and keep in mind that clicking the link does not mean the app was installed) and this attack was focused on Poland (we know some other languages were used in the webinjects as well – German example below). It also does not run if it detects the phone settings locating it in Russia, Kazakhstan, Ukraine, Belarus, Azerbaijan, Kyrgyzstan, Moldova, Tajikistan, Turkmenistan, Uzbekistan and United States (it misses the Baltics and Georgia on the list of post-Soviet states). 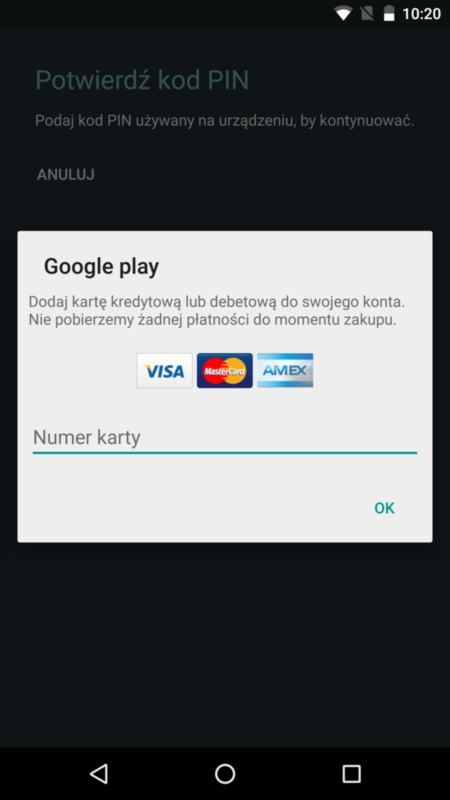 While the malicious mobile app does not steal banking credentials (as those are being stolen by it’s desktop companion), it uses the opportunity to steal credit card data via app overlays in Google Play, Gmail or Paypal apps. It looks like the security mechanisms implement by banks, in particular webinject detection, became such an obstacle to criminals that they had to invent new ways of forcing users to install mobile malware. We’re looking forward to news scenarios as we believe they will emerge soon.